When my hubby told me about what we're going to have for Thanksgiving, I was unsure how to react. He was going to order a smoked turkey from Mr. Tony's BBQ. 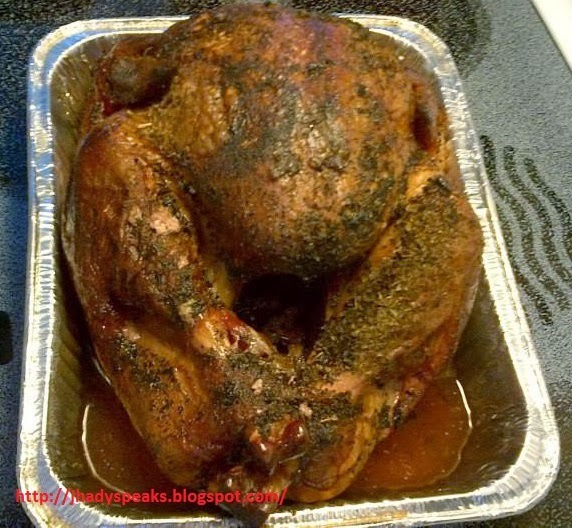 In my mind, I thought that smoked turkey might taste like smoke and the texture is dry. I am not a big fan of any smoked meat products. My reluctance came from not knowing how it tasted like. However, since my hubby likes it, I decided to support his decision. I'd like him to splurge on something he likes as a gift for being a hard-working man. Thanksgiving Day came and he brought home a 14 lb smoked turkey. After blessing it with a prayer, we all feasted on it. My preconceived thought was corrected, the smoked turkey was delicious. It was juicy and the sauce was savory. 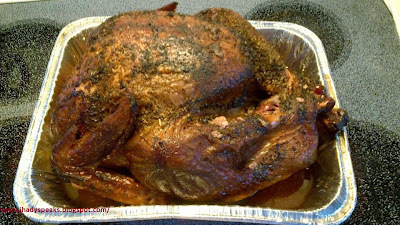 I found out that, the turkey was smoked for 5 hours with hickory, cherry and apple wood. No wonder it tasted good and I can taste those spicies he added on the meat. If you live in Wisconsin or just passing by and you want to grab something to eat. Mr. Tony's BBQ has a daily vending store in Fredonia, WI, but close during winter months. However, he still does parties, provides food for pick-up and drop off orders. He also sells other meat products. He will grill, smoke or deep fry it for you. 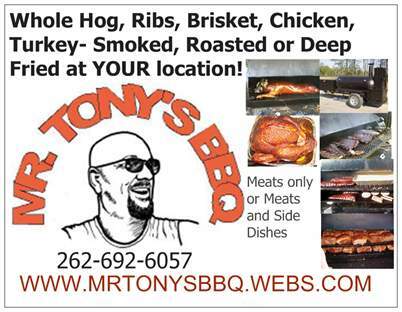 To find out more about it, visit this site, Mr. Tony's BBQ or click and follow this Fb page. Disclaimer: I didn't receive any form of payment. Just a happy and satisfied customer who wants to give an honest review. All opinion is 100% mine. Smoked turkey sounds yummy, I have never had one hehehe. I love the food truck concept and the smoked turkey looks really mouth watering. That looks delicious. I've never had turkey in all my life, smoked or not. :) Is that a roasted pig I see in there? Yum, yum! Oh, looks very, very sumptuous! I just had turkey for our Christmas Lunch in the office today and it wasn't cooked like that of the picture you have posted. It was just baked/roasted in the over. That turkey of Tony's looks so yummy! I want a piece of that pork's skin must be crunchy and now i'm missing roasted pork so bad. That looks fantastic. We're only a couple hours from Wisconsin, what part of the state is this in? Ohhhhh... that smoked Turkey looks really good! You are making me hungry for some Turkey. Waaaaaaaa...... thanks for letting us know just in case we happen to visit Wisconsin. :) Yummy Turkey! That looks so crispy and yummy sis! I would love to try a BBQed chicken!